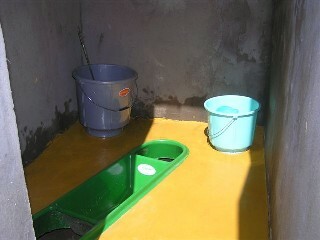 In April and May 2006 EcoSolutions built four Dry Compost Toilets for the Ladakh Environmental Development Group in Leh. Leh, in the rain shadow of the Himalayas, receives only 4 cm of rain a year. Water is precious and people depend largely on the annual meltwater from the glaciers. The wonderful traditional Ladakhi toilet is an excellent sanitation technology but takes space that is less and less available in Leh town. Also there is a booming summer tourist industry that expects western waterflush toilets. This is a luxury Leh can ill afford. It wastes precious water and there is no way to handle the sewage effectively. Septic tanks and cess pits, hitherto unknown, now pollute the water courses and springs of meltwater in the town. The Dry Compost Toilets built by EcoSolutions with LEDeG and funded by BORDA are an attractive and sustainable alternative that can save Leh's precious water and protect its water supplies, springs and streams from human faecal pollution. 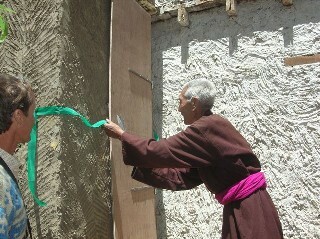 Here you can see the LEDeG Chairman, Lobzang Stanzin, opening the inaugural toilet at LEDeG's office compound. About 70 people came to the inauguration, among them members of the Autonomous Hill Development Council of Ladakh, senior PWD engineers, NGOs of Ladakh such as SECMOL, LOTI, LEHO, school and college heads, Guesthouse owners, etc. An introductory workshop was held at the Women's Alliance of Ladakh with many of the women and members coming to understand the value of the compact nature of the Dry Compost Toilet and its advantages in the urban context. A special meeting with the PWD Jammu and Kashmir Chief Engineer explored the potentials of ecosan for Leh, Kargil and other areas in Jammu and Kashmir. 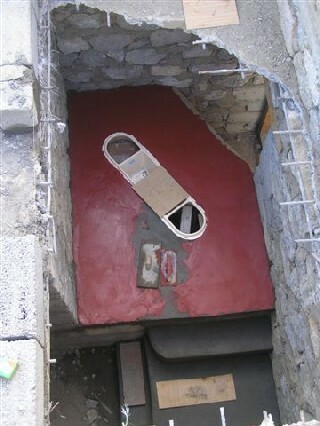 Toilets were also built inside homes - you can see this one (above) under construction inside a Ladakhi house. A seated urine diverting compost toilet (left) was also built in the LEDeG staff guesthouse. 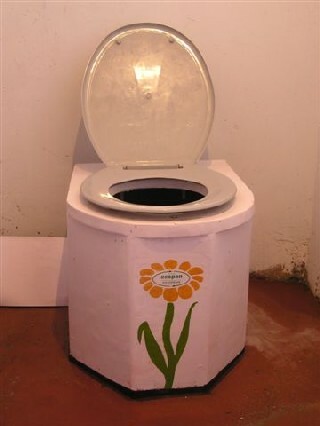 All the toilets used EcoSolutions ecopans. Provision for collecting urine in insulated tanks were also made.